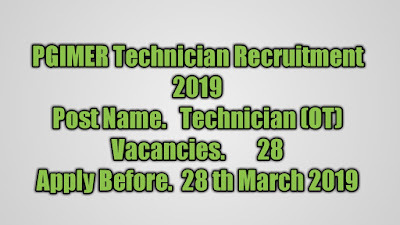 PGIMER Technician Recruitment (2019) - 28 Posts of Technician (OT) .Recently The government Chandigarh had Declared the latest Job notification for The Post of PGIMER Technician (OT) Recruitment 2019 . Brief detail has given below. The candidates may consider the given information regarding vacancies and Eligible Interested candidates may apply online before 28 March 2019.